Because the amount of water that can be contained in air is a function of the temperature and pressure on that air, our next step is to look at ways to remove moisture by changing the temperature or pressure. As air is compressed, the dew point or temperature at which water will condense is raised. 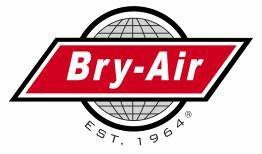 Therefore, to get dry air we need to find a way to cool the compressed air. But costs can be prohibitive because equipment, space, and auxiliary equipment are necessary for the process. However, if compressed air is already used in the primary operation and only very small amounts of dry air are needed for humidity control, compression may be a feasible route to dry air. When air at extremely high pressure (over 200 lbs/sq in) is needed, small quantities of high pressure air may be used to maintain small enclosures at the required moisture level. It is also possible to use small amounts of the high pressure air with a smaller air facility to control moisture on a limited scale. Lowering air temperature decreases the air’s ability to hold moisture. Thus, the air can be made drier by cooling it. However cooling air just to dry it is usually not practical. An exception might be when cool air is needed anyhow, that air’s dryness satisfies the needed moisture conditions, and enough conditioned air is available. Normally, this method is reserved for applications where outdoor air is being dried to levels only slightly lower than the incoming ambient – that is, the system air. To remove large amounts of water by cooling the air, over-cooling and subsequent reheating are required. But such procedures typically have problems with operation and maintenance, as well as cycle and control; the method is unsuitable for producing large quantities of dry air. Another limitation to this technique is the freezing point of water. When air is dried via refrigeration, the cooling surfaces of the coils may reach sub-freezing temperatures. This causes ice to form, which, in turn, reduces the efficiency of the cooling system. So anti-icing devices or dual systems and defrost cycles may be required. To prevent such cooling coil icing, a brine spray is commonly used. The brine must be reconstituted periodically or continuously. This requires additional equipment, maintenance and operating costs. Although this strategy is workable and often satisfactory, the complexities associated with cycling and controlling are detracting factors. A special case involves a brine spray that can pick up moisture from the air at normal temperatures. This brine must be cooled and regenerated or reconcentrated either continuously or periodically. To deliver air at very low moisture, such a system is necessarily complex. For example, the brine must be mechanically refrigerated, and at all levels of drying, cooling must be used during the moisture absorbing cycle and after the regenerating or reconstituting cycles. The most simple, straightforward way to obtain dry air is to use desiccants—that is, adsorbents or materials that have a natural affinity for water. A desiccant is able to take up the additional moisture given up by the air without changing its size or shape. So an air stream can pass through a desiccant and become significantly drier without elaborate cooling, compression, cooling water, or other complex systems or controls. After the drying task is complete, the desiccant is regenerated via heat. Then the desiccant is ready to dry more air. 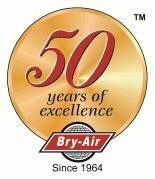 An added feature of the Bry-Air Dehumidifier is its ability to function equally well at extremely low to very high levels of humidity with no regeneration problems and no changes in cycle control. Its versatility in performing in any type of application is unique among most methods of drying air.